Have you seen the new SunChips commercials? You know, the one that they show the bag slowing become compost? You haven't?! Well, head over to Our Small Step on YouTube. I think it's so interesting how a bag from chips can become compost! And I commend Frito-Lay for doing it! SunChips and National Geographic have teamed up to present the Green Effect Contest. Everyone is eligible to enter this contest. All you have to do to to be one of five groups or individuals to submit your idea how to make your community more green, and you can win $20,000 to make that dream a reality! The winners will also be profiled in National Geographic Magazine and will also win a trip to Washington, DC . Entries must be in by June 8th. Read the rest of the rules here. In a call to help consumers turn their green ideas into action, SunChips has partnered with National Geographic to launch the “Green Effect” – a national initiative where consumers can submit their ideas on how to make their communities green for the chance to win $20,000 to make that green dream a reality. 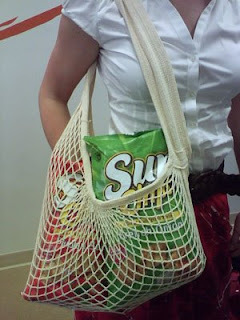 You can learn more about the Green Effect, the compostable bag and the other little steps SunChips is making by visiting http://championmediaclients.com/sunchips. 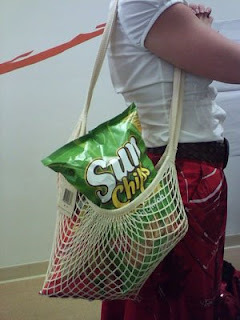 SunChips sent me a bag like the one in the picture above, along with Harvest Cheddar flavored SunChips and Garden Salsa flavored SunChips. Personally, I LOVE the Cheddar flavor (I could eat the WHOLE BAG by myself!) but I have tried the Garden Salsa version and it was good too! One lucky winner will win the prize in the photo above. As usual, extra entries I usually include are Twittering about this contest, Blogging about it, being a subscriber, etc. Just fill it out in the form. This giveaway will end on May 29th, 2009 at midnight.